Most factors, to some degree, are tied with how they affect the amount of time that is required to complete the tree removal process. More dangerous jobs require more time to complete; Trees that are in a poor location will require more time to remove, and trees that are above homes or near other structures often involve rigging (lowering sections of wood with ropes, arborist blocks and pulleys) which will require more time to remove. Anything that takes more time, costs more money. Also equipment costs come into play. Often there no other options to safely remove a tree other than employing the use of a crane which will also add a significant cost to the project. Often trees will out-grow their space as they begin to encroach on homes and over-crowd landscapes. When this happens, Green Leaf is very well versed and experienced at removing very large trees in tight spaces. 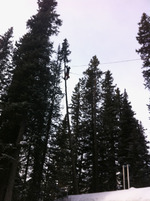 Attached are some pictures of Mike Plunkard carefully rigging down a large Cottonwood in the spring of 2011 in Golden.